In 1861 the headmaster of Woodhouse Grove School agreed with Thornhill Trustees to lay a pipe from two springs in Calverley Wood so to supply pure water to the school. This agreement lasted 34 years. The small reservoir in the wood still remains. This extract is from the wonderful ‘Guide to the Calverley Millennium Way’ which is available free in the area. 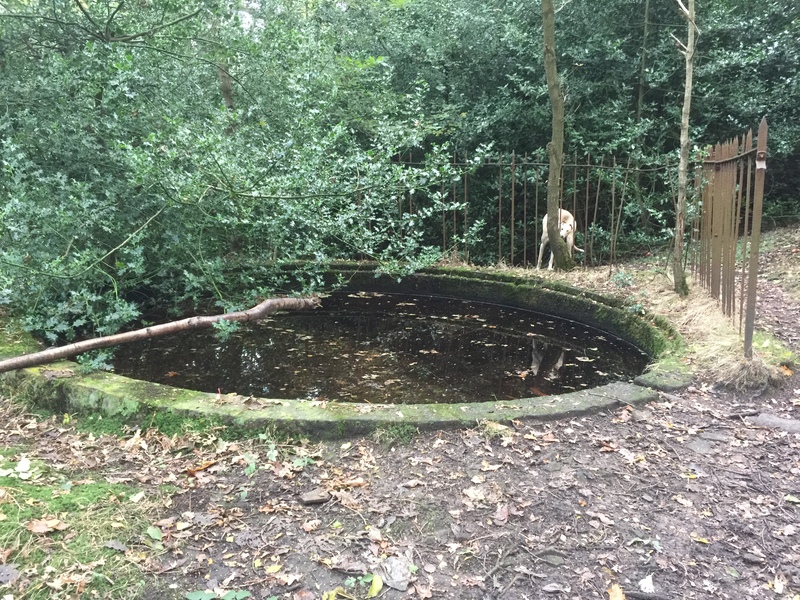 I too had been trying to find out what this well/pond was after stumbling upon it. The little guide has loads on the history of the area and is a credit to those who produced it. I have fallen in love with Calverley Woods. A magical place where my Tolkienesque imagination abounds. A wonderful playground for dogs and humans, with a interesting history. POWs, fireworks, quarries, stone circles and prehistoric markings. A playground for the imagination. Below is a small area of the woods. Check out Secret Leeds for more fastinating history about the woods, including descriptions of the explosion at the fireworks factory from people around at the time. I have always been interested in ideas, the way we think, how our brain works and philosophies. My Dad taught me to question things and always think for myself , even though he didn’t always like it when I questioned him! We had some great arguments in my teenage years, which became discussions later. Mum didn’t always like it when they became heated and always took my side lol. I have just finished reading a book called Moral Tribes – Emotion, Reason, And The Gap Between Us and Them, by Joshua Greene, which is so relevant today. A brilliant, very well written book, easy to read, which answered a few questions and really made me think. having said that, I found I had to stop after each chapter to digest what I’d read. The Tragedy of Common Sense Morality. Two tribes of herders one east of the forest the other west. The Eastern herders have a rule: each family gets the same number of sheep and each family sends a representative to the council of elders that governs the commons. Some families bred big sheep appropriating much of the Common, the council stopped this, one family poisoned another’s sheep and were punished. The Western herders share a common too. The size of the flock is decided by the size of the family. They also have a council of elders. One family had twelve children – some complained they were taking up too much of the commons. A different family fell ill, loosing five of their six children in a year. Some thought it unfair to reduce their wealth because of this. Another tribe lived in the North. there is no common each family has their own plot of land, surrounded by fence. Plots vary in size because some are more industrious than others.Some have bought their neighbours land. the less prosperous may have been unlucky, or had illness despite their best efforts. Other herders are exceptionally luck having very fertile land because they inherited them. The council doesn’t do much, just ensuring herders keep promises and respect each others property. There is much strife because the the differences. To the South, a fourth tribe shares pastures and animals. The council of elders is very busy. They manage the herd, the pastures, jobs and monitor work. Everything is shared equally. This causes much strife because some work hard, whilst others are lazy. Most work hard, some by community spirit and some because of neighbours judgements. the families are not as prosperous as those in the North but no-one has every died through want of food or warmth. One day a great fire burnt the forest to the ground. rains came and eventually where the forest was became a huge green pasture. All the tribes moved onto it claiming it as their own and bitter fighting ensued, causing injuries, death and feuds. To make matter worse another tribe came claiming it for themselves, saying their god had gifted it to them. It had been prophesied in their holy book. Another tribe claimed it as their ancestral holy land and yet another arrived with rules and customs, that to other seemed ridiculous. Black sheep must not sleep in the same enclosure as white sheep. Women must have their earlobes covered in public. Singing on Wednesdays is strictly forbidden. Feuding commenced………………. Despite this, all herders have much in common. Each tribe wants the same, but each tribe views morality in different ways. This is the Tragedy of Common Sense Morality. 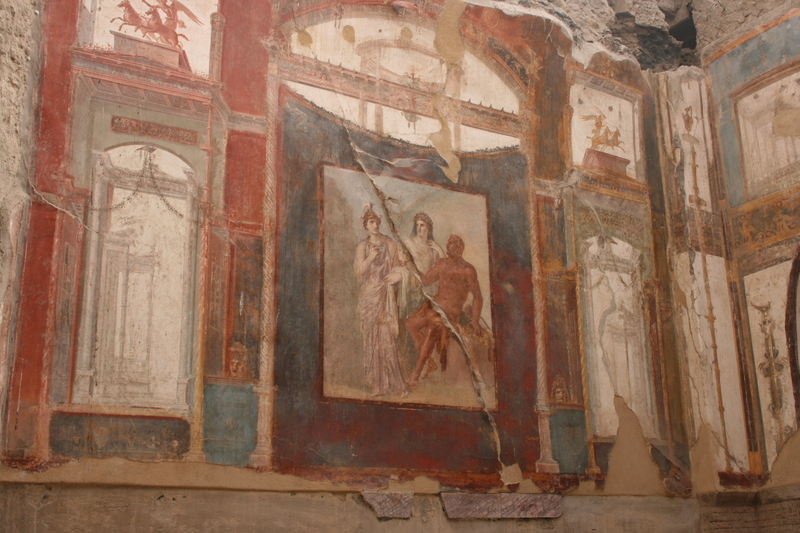 The photo on the right shows vesuvius in the back- ground. 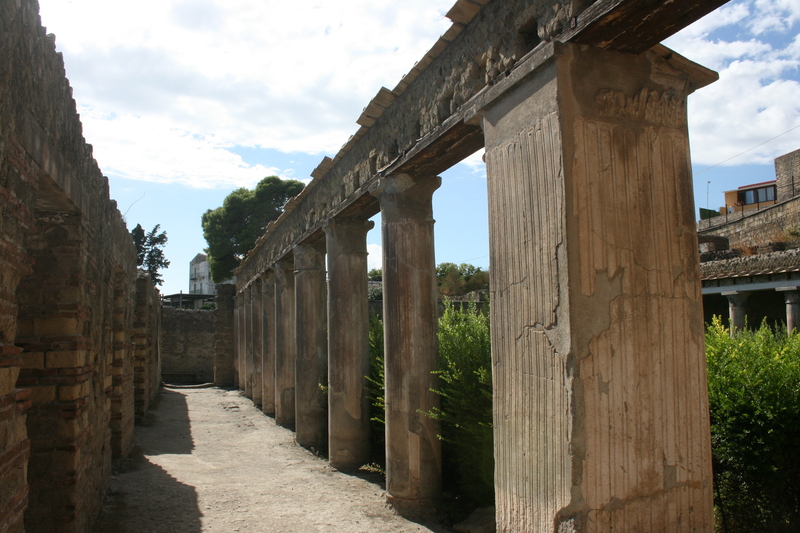 This Roman town, significantly smaller than Pompeii, was once a seaside resort and trading port town with quite wealthy inhabitants. There were about 4,000 inhabitants. 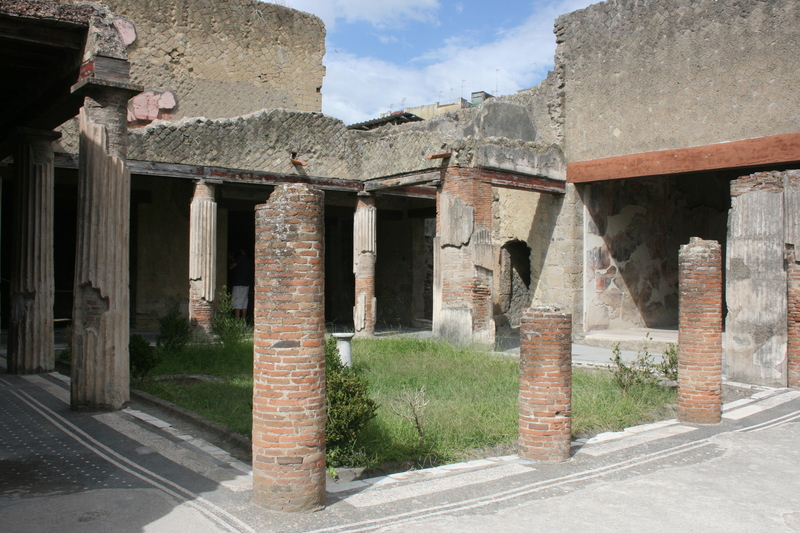 Herculanium is very well preserved, better than Pompeii, because whilst Pompeii was buried under the ashes when Mount Vesuvius erupted, Herculaneum was buried under tonnes of lava and mud in A.D. 79. 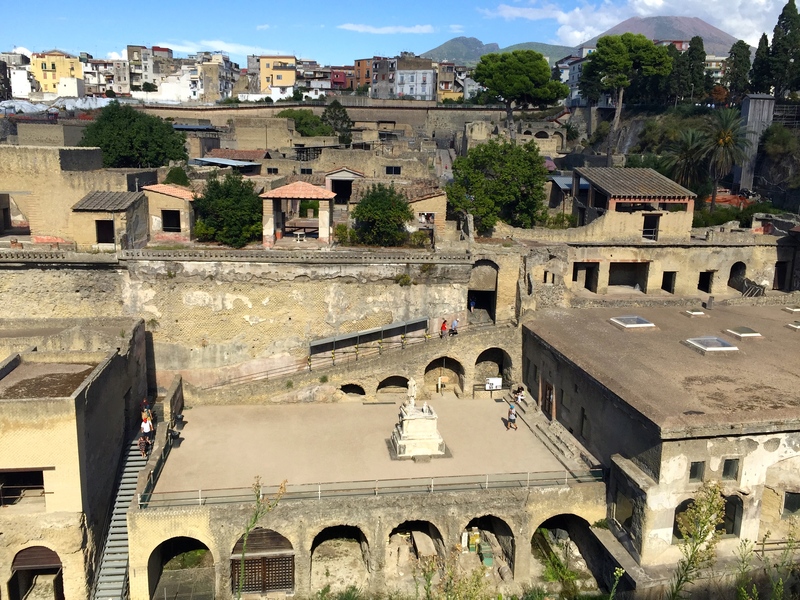 Herculaneum was originally discovered when a well was being dug in the early 18th Century at a depth of 50 – 60 feet below the modern surface. 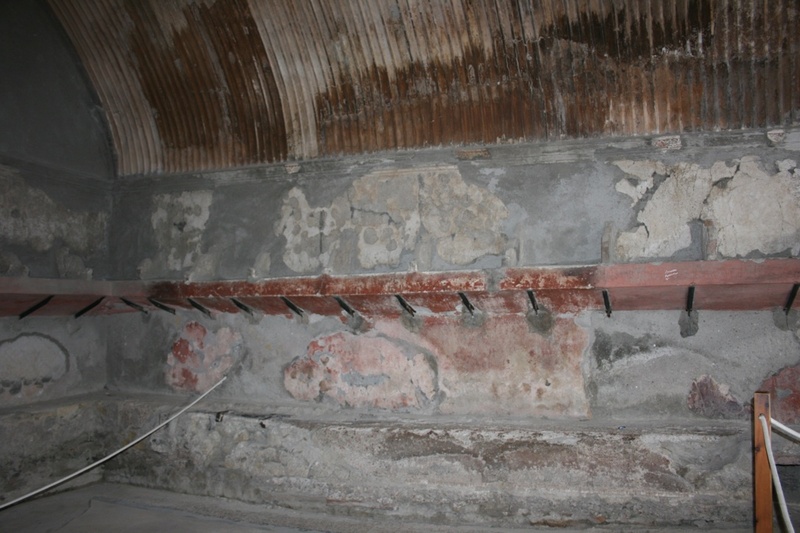 Initially a series of ‘robber’ shafts and tunnels were dug to strip the site of any saleable valuables. 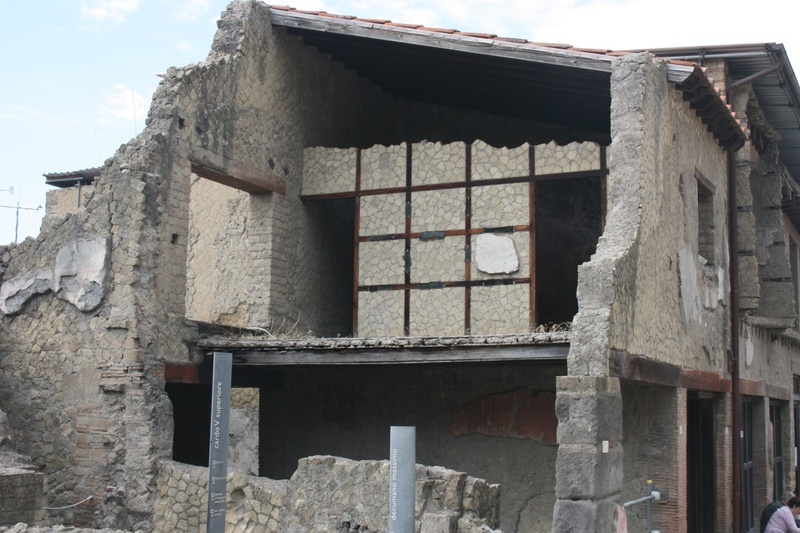 A basic plan of the town was mapped out and much of the portable remains removed but eventually these tunnels collapsed and were closed down. 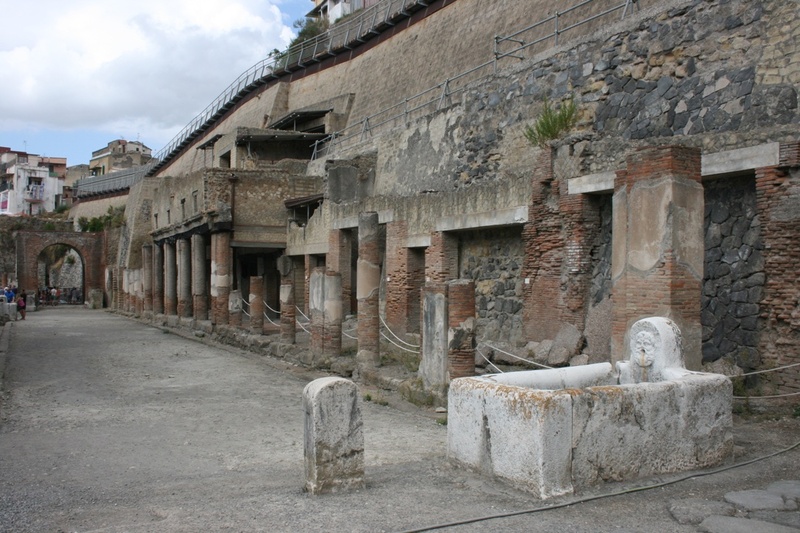 The modern towns of Resina and Portici grew up over the site and knowledge of where the entrances to the tunnels were was lost to the scientific community. In the 20th Century, archaeological excavations re-commenced on a more modern and scientific basis fully uncovering a small section of the town but it was found that the earlier tunnelling had damaged the structure of much of the surviving buildings. 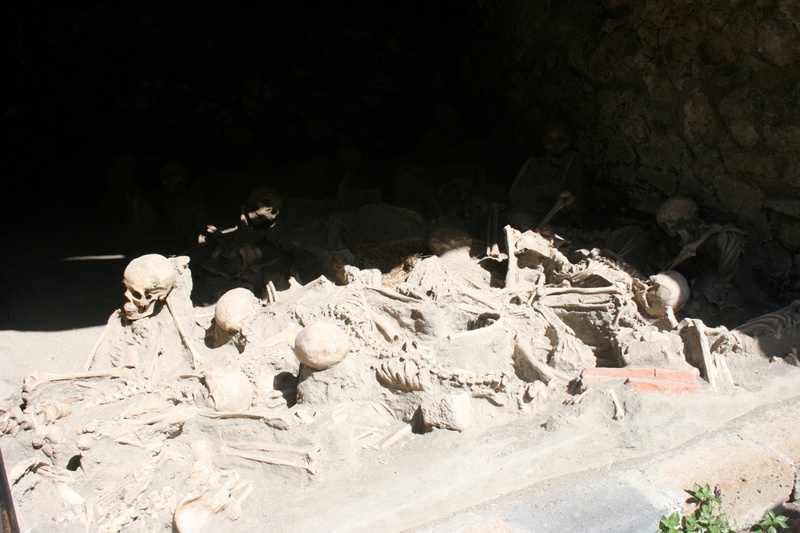 The site is also suffering from exposure to the elements and the periodic earth tremors, so there is a constant battle to try and preserve the remains. 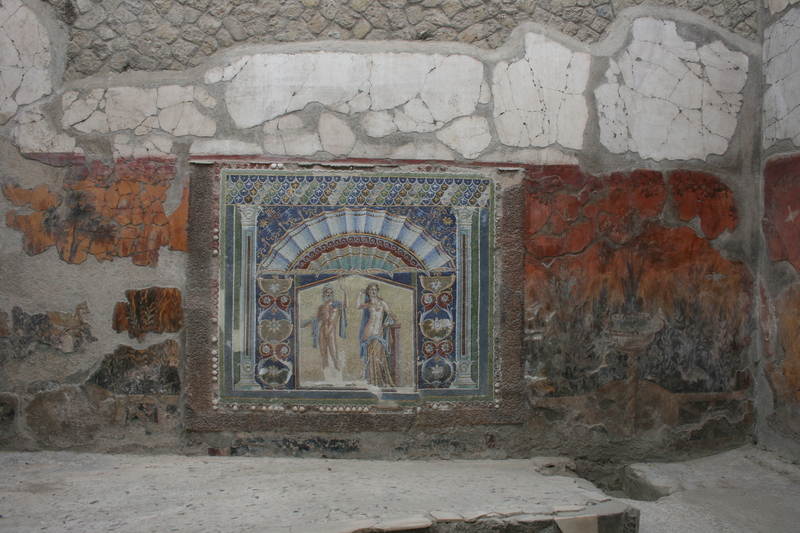 The mosaic on the right was on the floor in the baths. 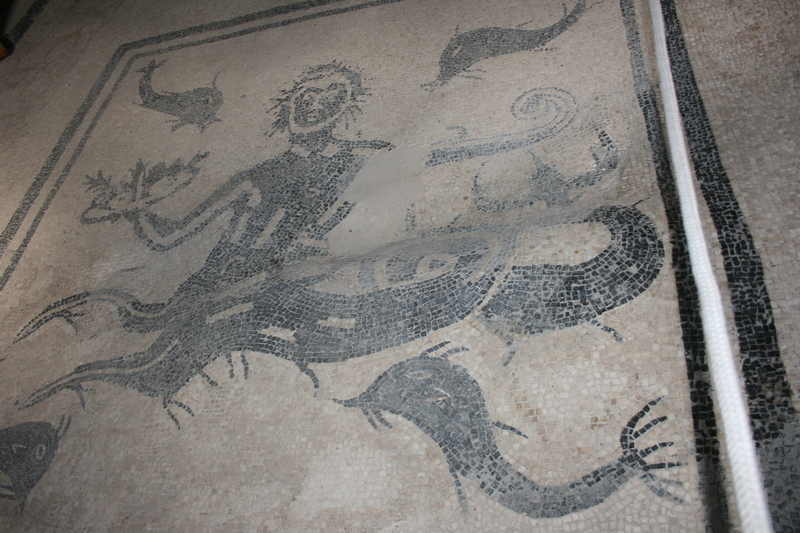 The mosaics and wall frescos are amazingly well preserved. 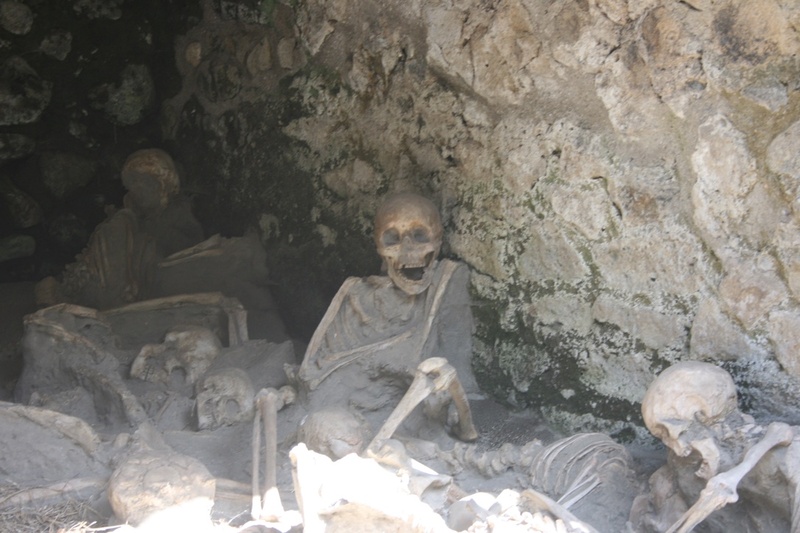 In the 1980s hundreds of bodies were uncovered between the arches tucked into the town walls (boat storage areas) and the wall of volcanic stone the entrance tunnel buries through. It is believed that people fleeing the city huddled here in the hopes the arches would provide protection from the volcano. The majority of people who died were gassed by the sulphuric fumes. They were not prepared at all. On the right you can see some the perfectly preserves vessels. 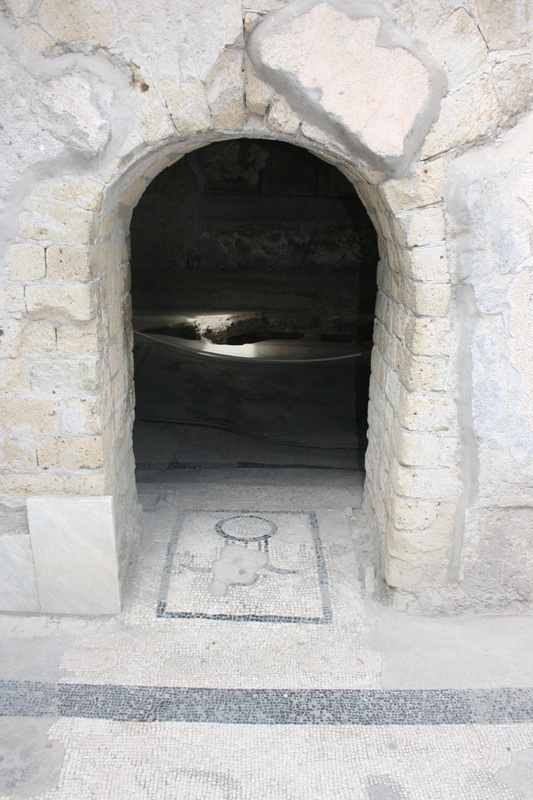 Here we have the entrances to to male and females baths. 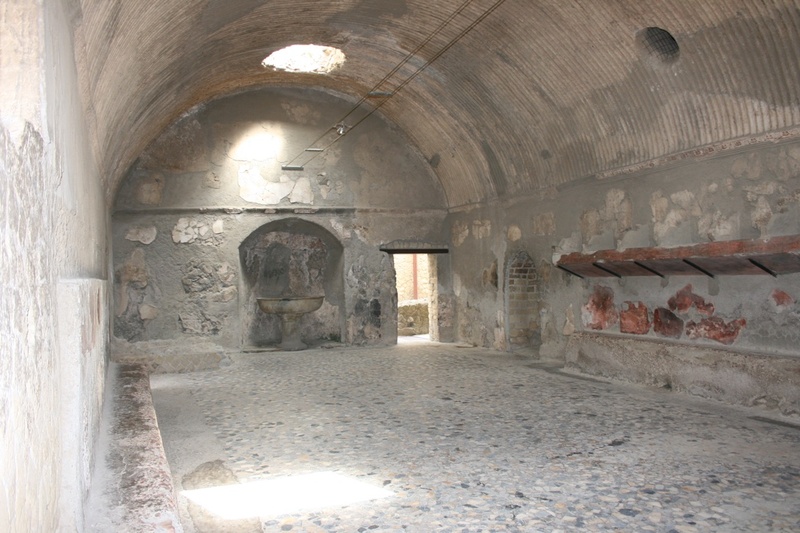 To the left are the changing areas of the baths. You can see the shelves where they would leave their clothes. 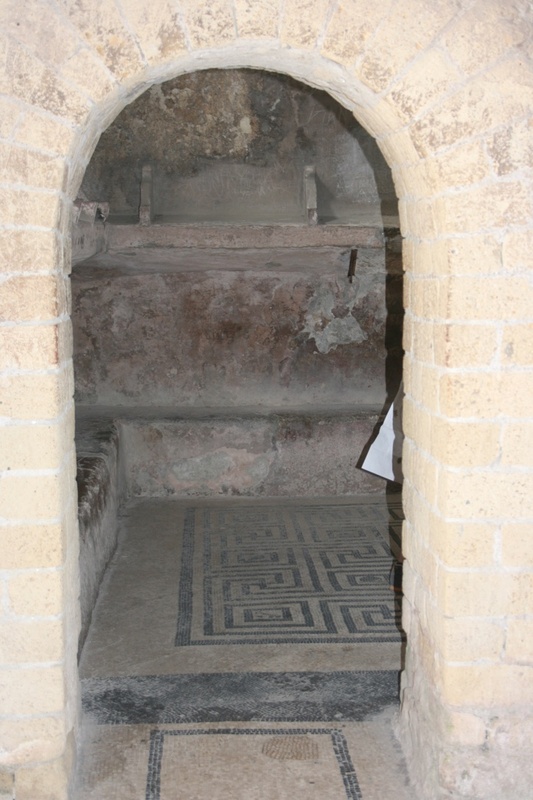 To the right are the actual baths. 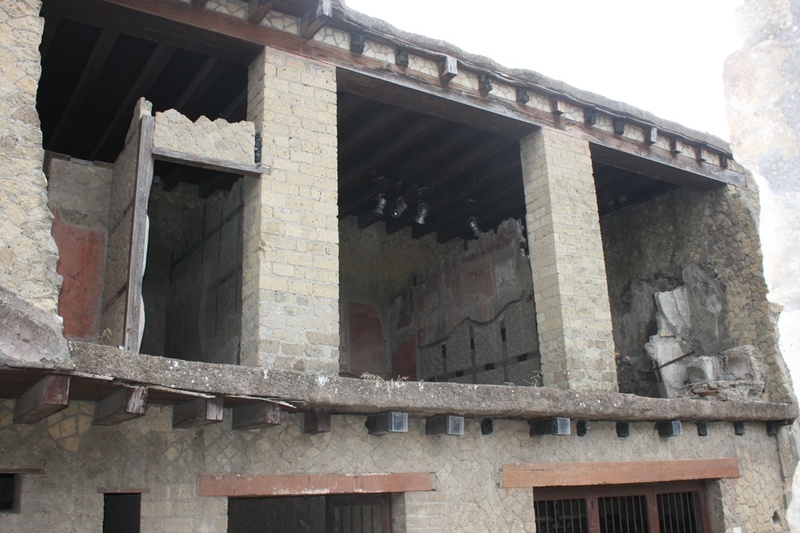 Some remains of building are still two storeys high and with wood still preserved. On the left are some food serving counters. Food would be prepared and placed in these serving bowls. 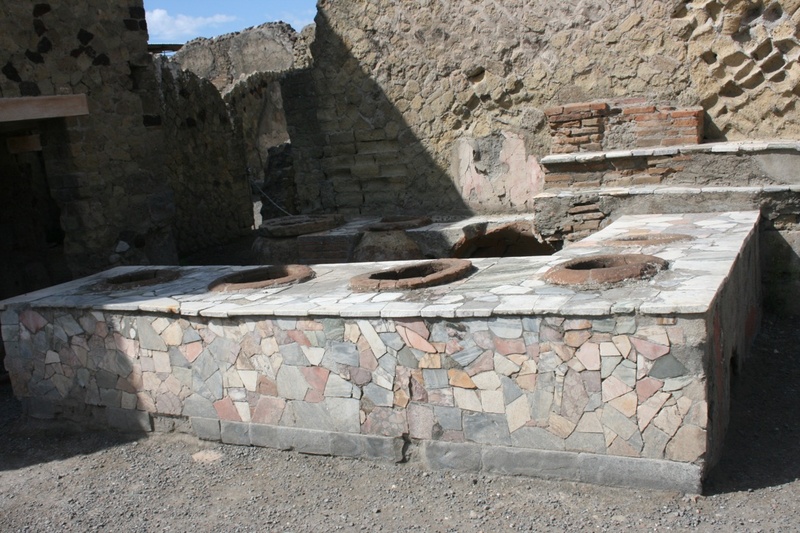 Many of the houses had no cooking facilities and they ate out. The streets were planned and laid out in cross sections. There were shops and services. 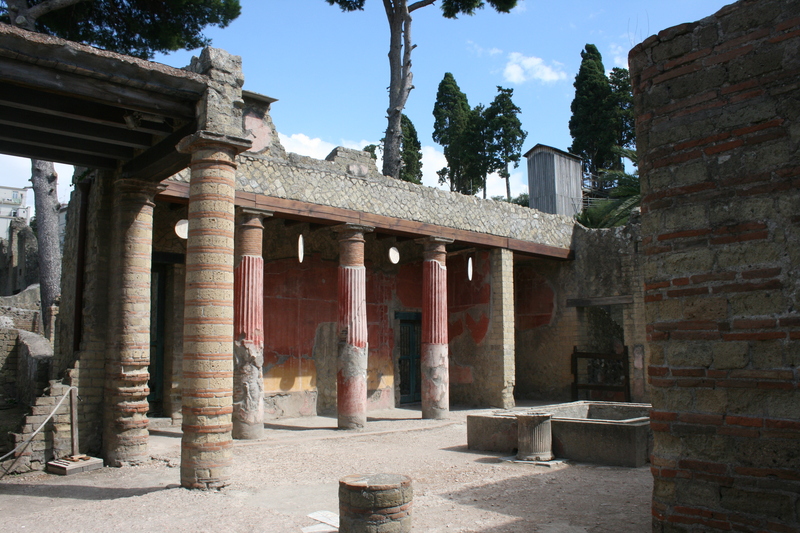 This is just a tantalising taster of what the way of life was like for the wealthy in Roman society. 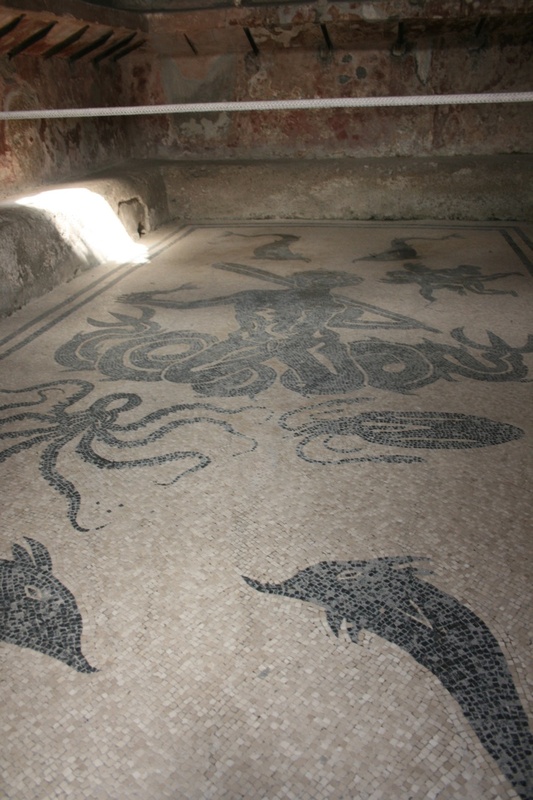 There is so much more to see and explore at this site. I found myself standing still, totally in awe at some of the things I saw. I stood and thought of all the hustle and bustle that would have been occurring here in its heyday. 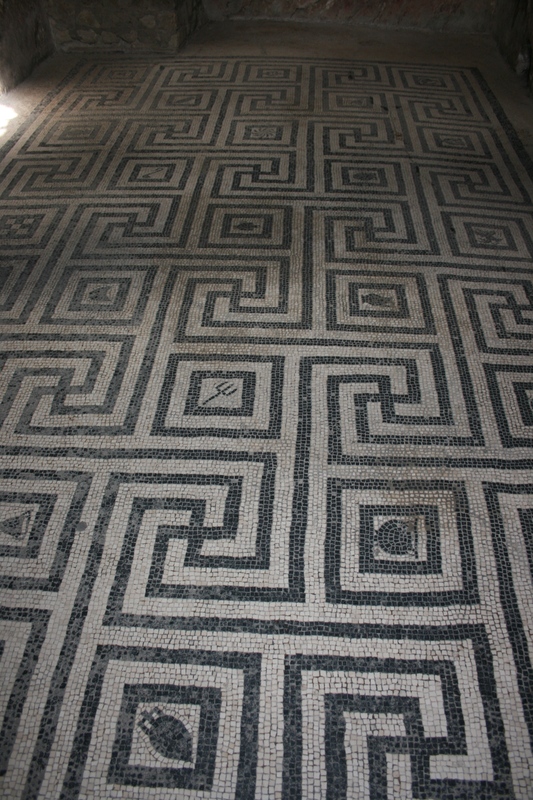 I walked down steps worn by Roman feet and marvelled at what they achieved. 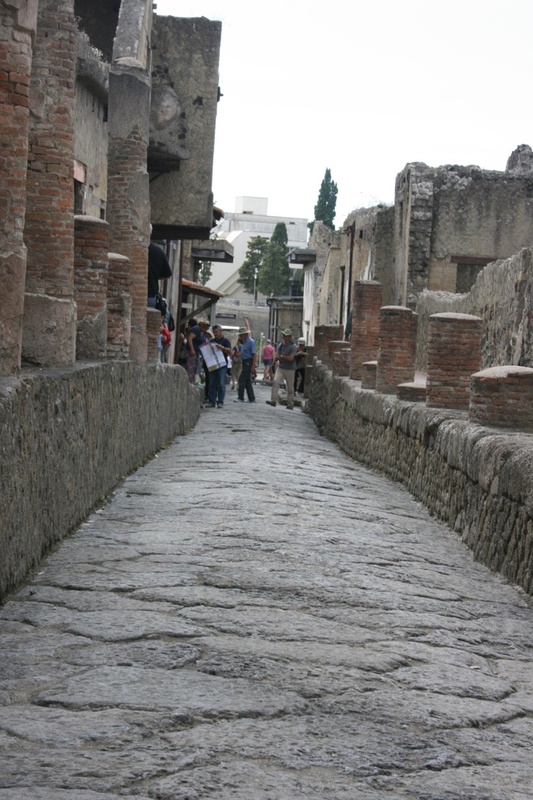 I gazed from the streets of ancient Herculanium upon Mount Vesuvius and tried to grasp the enormity and horror of that eruption, the scale of terror and horror that it caused. Nature can never be tamed. I loved PETER GREENS FLEETWOOD MAC but after he left they evolved from blues to a perfectly magic formula with Christine McVie, Lindsay Buckingham, Stevie Nicks,John McVie and of course the amazing drummer that is Mick Fleetwood. All such brilliant musicians individually together they are dynamite. A perfect evening in a perfect arena. Wimbledon is here again! I love Wimbledon Tennis Tournament. The coliseum like atmosphere, individual against individual, facing each other across the net. The sound of the balls flying over the nets, skimming the surface and sending flying blades of grass, chalk and dust. The physical stamina and fitness, the mental strength and character needed to take part. The sweat, the glow, the ping of the strings as an ace is hit down the line. Volleys, backhands, smashes, net calls, slips and slides, twists and turns. The crowds, the gasps, the screams of frustration, the shout of joy and pumping of fists. The line calls and hawk eye replays, the anticipation and the nerves, the tension of a tie break. The British weather sunshine now and rain again – the covers on the covers off, the roof closed the roof open. Robinson drinks, green towels, linesmen and women dodging powerful shots coming right at them. The birds on the court and Rufus the Harris Hawk. Henman Hill or Murray Mount – game, set and match. Rats ‘dream’ paths to a brighter future: When rats rest, their brains simulate journeys to a desired future such as a tasty treat — ScienceDaily.